Last week, the Belarusian Institute for Strategic Studies (BISS) released a new ranking of Belarusian political activists based on media coverage in January-March 2013. The BISS study suggests an undersupply of political initiative among Belarusian political figures. According to BISS, the quantity and quality of political communication by Belarusian opposition figures do not necessarily go together – possibly a symptom of the uneven playing field in authoritarian regimes such as Belarus. This article uses the BISS list as a representative sample of Belarusian political opposition figures to learn about these people’s paths into politics. Belarusian political activists are highly educated, are likely to be affiliated with political parties and have suffered arrests and imprisonment. Strikingly, one fifth of the political figures on the BISS list are in exile. Even so, for many political repression has become a right of passage into political visibility. The BISS study examined both qualitative and quantitative characteristics of media communication. The study went beyond being academic and aimed at contributing to the improvement of political communication in Belarus. The quantitative index measured the number of media references and the size of audience covered by the online and print media as well as personal communications. The qualitative index takes into account the content of media references and consists of indices of expertise, initiative, and political action. The figures on the BISS list are political actors broadly defined; many of them are civil society activists rather than politicians. According to BISS, among the top-12 political figures include distinct groups: a group with a high quantity of communication but average quality; a group with the most balanced quality communication, a group of women politicians with a high quantity of communication but “a complete absence of political initiative”. Analtoly Liabedzka leads as far as the quantity of political communication goes, with 197 references in the media and the largest audience. Uladzimir Niakliaeu, at 244 references in the media occupies the second place, and Andrey Sannikau finds himself in the third place. Notably, these politicians feature in the media due to their political activity rather than personal life events or the bad luck of being imprisoned. The only politicians according to BISS to have voiced new economic initiatives, Andrei Dzmitryeu and Aleksei Yanukevich, have high marks on the qualitative index but much less impressive quantitative results. Aliaksandr Milinkevich, Aliaksei Yanukevich, Andrei Dzimtyieu, and Vital Rymasheusky have the most “balanced” communications, in terms of both quantitative and qualitative media presence. This indicates the absence of political debate over important issues in Belarusian media. In fact, many political figures resemble citizen bloggers, expressing opinions but not engaging in constructive discussions over solutions of the day-to-day problems facing Belarusian citizens. Some opposition politicians prefer to pose as victims and freedom fighters rather than address the mundane issues that interest the average Belarusian citizen. Of course, the dependence of Belarusian political activists on foreign donors may explain such behaviour. In the end, this limits the opposition’s appeal in Belarus. How well do Belarusians know the figures on the BISS list? 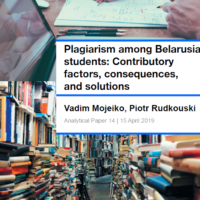 In June 2013 the Independent Institute of Socio-Economic and Political Studies (IISEPS) published a study, which indicated that only about a quarter of respondents came up with names of politicians who represent an alternative to the current president of Belarus. When offered a list with names of politicians, however, the IISEPS respondents produced rankings slightly different from the ordering of the BISS study. One reason for this discrepancy could be that the BISS study took place at the time of relatively low political activity, with no elections on the horizon. A few names included in the IISEPS were missing completely from the BISS list, however. Who Becomes a Political Activist in Belarus? The provisional character of the BISS rankings notwithstanding, the biographies of the political actors mentioned by BISS allow learning more about the careers of people who become visible in Belarusian politics. Although each actor has his own background, the basic features that many of them share common characteristics. First of all, six out of thirty on the list live in exile in Western Europe or the United States. Political asylum undoubtedly limits these people’s influence in Belarus, so their visibility in Belarusian media may appear surprising. The average age of a political activist in Belarus is 50, with Stanislau Shushkevich, aged 78, being the oldest and Anastasia Palazhanka, aged 22, – the youngest representative. More than half of the people on the BISS list come from Minsk. Only two out of thirty people on the list are independent from any political party or movement. Given the underdevelopment of the Belarusian political sphere and the wariness of political parties as such after the decades of Communist dominance, this strikes as a remarkably high number. After all, in June 2013 IISEPS study, only 15.3% of respondents said that they trusted the opposition parties. Even so, the Belarusian parties remain far from being truly programmatic, and the popularity of the people in the BISS list focuses to a large extent on personalities. Two paths to political opposition stand out from the biographies of people in the BISS list. One was followed by the political figures well-known already in the 1990s. These people have some political experience, having served in the Supreme Soviet of Belarus, regional representative bodies, or diplomatic service. Some even initially cooperated with the Lukashenka regime. For nearly all of them, the constitutional referendum of 1996 became a turning point, marking the start of their careers in political opposition. Another group came into politics from other paths of life, with their political experience starting in the Belarusian Popular Front, Charter97, or as citizen journalists. These people first came into the spotlight after their arrests. The very real repercussions of their political activities have made their names familiar to the general public in Belarus as well as to the international organisations and probably strengthened their motivation to stay in politics. These two possible paths to opposition suggest that while repression may discourage political involvement by some and increase the number of politicians in exile, in the longer run repressive measures only increase visibility of the political opposition and can possibly turn even politically neutral people into the regime opponents. Oppression in Belarus also draws the attention of foreign donors, increasing international visibility. In the beginning of July, an unpleasant incident occurred in Homiel city, the centre of Homiel region. A 23 year old boxer beat up seven people on the street, including three women. The aggressor stated that he did this out of disrespect for alcoholics – some of the people he beat were drinking alcohol in the street. However, it turned out that he was himself drunk since the morning time. Such cases are not uncommon for the Homiel region. It always had a reputation of highly criminal area of Belarus. Homiel region is also known for high drug use and related to it number of HIV-infected people. The region has another long-term problem – it suffered most from radioactive contamination after the Chernobyl disaster of 1986. Along with the Mahiliou region, it serves as the main base of support of the Lukashenka electorate. Yet Homiel has produced many positive figures, such as Kirk Douglas and Maria Sharapova, whose families descend from here. The Homiel region has the second largest population after the Minsk region and ethnically is 88% percent Belarusian, an average number for Belarus. Along with another region of East Belarus, Mahiliou, it serves as the main electoral base of Aliaksandr Lukashenka. Its current governor, Uladzimir Dvornik presents a case of divergence from usual personnel policy of Lukashenka. If previously he tended to appoint residents of other regions to the post of governor to prevent the formation of regional clans, now it appears this rule does not always work and he has changed tactics. Dvornik comes from the Homiel region and earlier occupied a post in the Mozyr District Executive Committee and also served as senator to the Council of the Republic, a representative body in the pocket of the regime. However, Dvornik presents a typical case of a governor regarding his profession – he has dealt with agriculture most of his life. Economically, the region has a well-developed industrial base with around 300 industrial plants. Among them stand such giants as the Mazyr refinery and Belarusian metallurgical plant in Zlobin. Uncommon for Belarus, however, the region posesses mineral deposits and even has some oilfields. Homiel region received the largest amount of radiation of all Belarusian region after the Chernobyl disaster. The region’s name became synonymous with contaminated lands in Belarus. The southeast of the region remains a so-called alienation zone, where a special regime exists and the movement of people is highly restricted. As is true in other regions of Belarus, civil activity in Homiel remains scarce and is concentrated in its regional center, Homiel city. The oldest local civil association, Talaka, has been in existance since 1986. It became the center of the rennaisance of Belarusian culture after the USSR’s collapse. Today, its activists continue to study local history and culture and defend its architectural heritage. Despite the difficulty of work of NGOs in Belarus, some initiatives still appear from time to time. The civil initiative “Stop Drinking – Start Living” is a recent case of youth engagement in civil action. It arrived on the scene in 2011, when Homiel resident Zmicier Karaskou decided to raise the problem of alcoholism among Belarusians. The activists of this initiative try to draw attention of the local population and authorities to the problem by creating informational materials, advocating anti-alcohol policies and by organising amateur sports competitions. As Zmicier says, local authorities tend to ignore their activities. The authorities cannot comprehend that citizens can organise themselves without a state order to resolve societial problems and, in the end, they perceive this civil society project as opposition activity. A number of world-famous personalities descend from Homiel region. Among them is Herschel and Bryna Danielovitch, the parents of american actor Kirk Douglas (originally called Issur Danielovitch). The jewish family fled to the United States in 1908 to escape the persecution of jews. Subsequently, their son Issur became one of the most famous actors of Hollywood’s “golden age” and is now ranked 17th in the list of the greatest male screen legends by the American Film Institute. Kirk, for his part, also became the father of Michael Douglas, another great actor of the 20th century. One more celebrity, currently world No. 2 in tennis, Maria Sharapova also has roots in Homiel. Her parents lived here until 1986, when the Chernobyl disaster occurred. They decided to move to Siberia in Russia to escape the contamination that took root in the region. Afterwards, her farther did his best to develop his daughter’s athletic talents. She entered a tennis academy in Florida and eventually became the world’s no. 1 female singles tennis player in 2005. A more unsuccessful story of Homiel-born celebrity is Andrei Gromyko, in 1957-1985 a foreign minister of the USSR and in 1985-1988 Head of the Supreme Soviet of the USSR. Gromyko is best known for his position in the Cuban Missile Crisis of 1962, the moment when the Cold War was on the verge of a global nuclear war. He refused to compromise during the crisis and the Soviet leadership, with the help of its intelligence services, had to use other channels to contact the US administration. The sides finally resolved the conflict for the good of all living beings on earth, but the actions of Gromyko are considered one of the greatest diplomacy failures in human history. Svetlahorsk, a city in the Homiel region, today looks pretty much like other Belarusian towns. But in 1990s it experienced the largest outbreak of drug use, and a corresponding HIV epidemic, in Belarusian history. The 40-year old city, created around several industrial plants, faced these problems right after USSR collapse. It lay on the route of a prominent drug trafficking route and getting drugs was not a problem here. Until the outbreak, little was known about HIV in Belarus, as authorities officially registered only a hundred carriers of the disease in the whole nation. When they started to check the rate of HIV-infection in Svetlahorsk, a thousand carriers were identified, which indeed was a shock for the whole country. As for statistics, the Homiel region holds first place in the number of HIV-infected people, with a total of 6,548 people since 1987. This number is three times higher than in Minsk, who has two million inhabitants. In Svetlahorsk alone, this number has reached 3,070. After drug consumption numbers dropped in the last decade, sexual contact has served as the primary reason for spread of the disease. Compared to other Belarusian regions, Homiel has suffered a great deal more, from the Chernobyl disaster to its criminal ridden history and disorder, not to mention its HIV epidemic. The region remains under the watchful eye of the authorities, as it requires a large amount of financial and human resources to tackle its problems. In the future, it could benefit from European Union membership and use of its structural funds which could help to develop resources and infrastructure in these problematic regions, as well as receive vast technical assistance. So far, the Belarusian regime has chosen to fight its problems with the money lured in from Russia. But the effectiveness and sustainability of this approach looks rather doubtful.